Stock photo of decorative lighting along the Village Stroll at dusk, Whistler Village, British Columbia, Canada. A background of beautiful deep blue sky adds to this scenic capture of this lovely village illuminated at dusk. 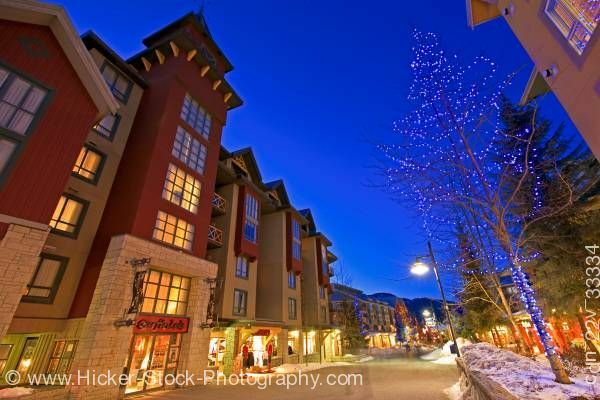 This stock photo includes decorative lighting along the Village Stroll at dusk, Whistler Village, British Columbia, Canada. The Village was designed to be a car-free town centre where people could flow like water. Being a strong focal point for the community, the Village has a town hall, fire and police station, medical clinic, museum, library, and more than 200 shops and 90 restaurants. From people-watching to sipping a latte on a patio, there is always something to do in Whistler Village. The free Village Shuttle helps you get around the different areas of the Village with ease. It runs from Marketplace (Village North) to the Upper Village loop seven days a week from 8:00 am to midnight. The front of the bus always reads "Village Shuttle" for easy identification.